Welcome to The Wild Gut and thanks for stopping by! So, what exactly is The Wild Gut? Well, if you want to learn how to brew your own kombucha and improve your gut health, simplify and improve your fitness, and be more present and mindful in your everyday life, then you’ve come to the right place. Being healthy (inside and out) and living a meaningful life is our main goal as we work our way through this crazy world. There are many hurdles you run into on a daily basis, so we’ve implemented certain practices to allow us to better navigate all the challenges we face. The three pillars where we focus our attention are – Food, Movement, and Being Mindful/Present. In 2014, we put our careers on hold and traveled the world for two years. We met wonderful people all around the globe and we knew we couldn’t just go back to the way things were before we left. 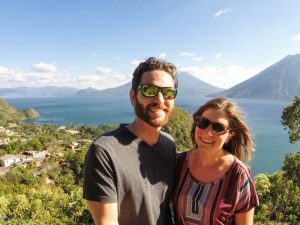 So, we purposely chose to spend our last five weeks in a small Guatemalan village on the banks of beautiful Lake Atitlán. It was here where we focused on getting our physical and mental health on track. Our daily schedule included hikes, yoga, reading, meditation, and plenty of fresh fruit and vegetables. We don’t claim to know it all, but we’ve found success physically, mentally, and emotionally after focusing on what really matters and leaving the rest of the junk out. We encourage everyone to reflect on their own life and see where improvements can be made. Nobody is perfect, that we know for sure! Want to learn more? Subscribe to our email list to get the latest updates, and feel free to connect with us on social media too. We love showing you what goes on behind the scenes on Instagram, Facebook, Twitter, and Pinterest.